Horses For Sale or Lease - Welcome to Foxview Stables! Dusty is a 19 yr old, 15.3hh QH x TB experienced jumper mare available for on-property lease. 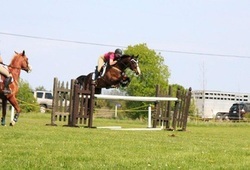 Has competed up to 1.20m jumpers on the A circuit and Pre-training eventing. Currently doing low-level dressage with an adult amateur rider. Perfect for someone wanting to start in the jumpers/eventing or move up a level. Fast and honest. Exceptional movement and scope. Not a complicated ride over fences - can take a novice around a course - but needs a more experienced rider to show her true potential. Visit our photo gallery for more pics. Please contact us for lease details.